I had three important milestones of faith when I was growing up: Baptism, First Holy Communion, and Confirmation. For Baptism, I was just a baby, so I had no conscious decision. First Holy Communion came only after Confession; that was a big deal for a first grader with six years of sinning behind her. The most important was Confirmation. After Confirmation, I was a warrior for Christ, a defender of the faith, ready to be martyred. It was a conscious decision; I would be an adult in the Catholic Church. Now that was scary even for someone in the sixth grade and half-way to being a grown-up. There were so many questions and answers to memorize: Who made you? Why did God make you? Who are the three persons in one God? What are the seven deadly sins? What are the seven gifts of the Holy Spirit? What are the Ten Commandments? Which is the most important Commandment? Name the twelve Apostles? Mom drilled me on the Catechism every morning before school, while she brushes my hair into a tight, high pony-tail. I knew I was old enough to brush my own hair, but Mom brushing my hair was better than chocolate chip cookies hot out of the oven. The Bishop came all the way from the Cathedral in the City to our little church. He asked all the questions. He asked each kid as many questions as he wanted, in front of everyone. If I failed to answer them correctly, the bishop might tell me to sit back with my family. I only got one chance. I better be ready. If I made it through the examination, next came the anointing with holy chrism. Only three times can I be anointed: Baptism, Confirmation, and Extreme Unction. Extreme Unction only happened right before death, maybe that’s why it was called Extreme. There’s Holy Orders when a man became a priest, but that’s out of the question for me, ’cause if you’re a girl, or if you have a club-foot, or if you’re illegitimate you can’t be a priest. Anyways, the anointing part was a cinch. Father did that, and I walked up the aisle for Holy Communion every Sunday. When I was littler, I worried about tripping or finding out my dress hiked up in back. But that was way back in first grade. It’s the slap that really scared me. Before I could get Confirmed in the faith, the Bishop slapped my face. If I could take it, it showed I’m ready to suffer for the Lord. It showed I’m ready to take the blows that came with the territory. I got spanked plenty, but never slapped in the face. My friend Betty’s mom slapped Betty’s face lots of times. Mom says slapping in the face is denigrating; I guessed it’s okay for a bishop. Most Saturdays my friend Mike’s or Ronny’s mom, or my mom drove us all to Catechism. Ronny and Mike both rode my bus to school. I loved Ronny’s house. The screen was missing from the storm door, so all the kids in the house just jumped on through the space where the screen was ‘sposed to be. Sometimes their dog jumped through, too. On school days, when the bus stopped at Ronny’s, it looked like circus clowns coming out of a little car. Ronny had ten kids in his family, one more than me. One by one the kids jump through that door, hair sticking out in every direction, pulling their sweaters on as they ran, lunch-pails sailing behind in one hand, the high-schoolers books skitting out every which-away. I tried hard to get to the bus-stop before the bus got there, ’cause otherwise I’d be in trouble. It’s impolite to make the bus wait, and if I missed the bus, I was eyeball-deep in trouble. After Catechism, if Mom was late to pick us up, which was almost always, me and Mike and Ronny and my best friend Connie, who lived in town and walked to Catechism, sat on the church steps and talked about Confirmation. We were all scared of the slap. Besides studying the Catechism, I studied the saints’ lives, to pick the right Confirmation name. The saint I picked looked out for me. I guessed when you’re an adult, you need more than a Guardian Angel. One things for sure, I nixed St. Cecilia from my list. She had her head just about hacked off, just hanging by a thread. She prayed that she’d live long enough to warn her Bishop that the Roman soldiers were coming. That gave me the heebie-geebies; I didn’t trust her to look out for me. I wanted St. Francis, the patron saint of birds and animals, but Sister said no, I had to pick a girl. 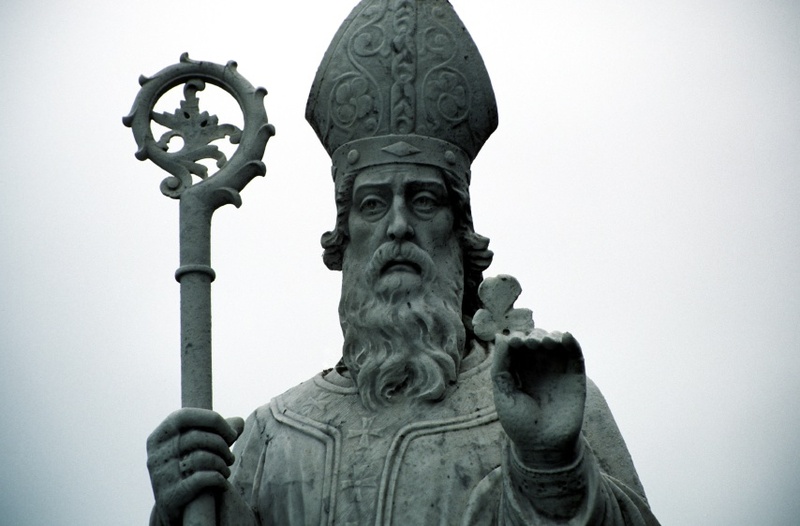 I was pretty sure Mom thought St Jude was right for me: the patron Saint of lost causes. She was all the time praying for him to intercede for me, which made me a little bit sore at her. Then I had to confess that, ’cause getting sore at your parents is a sin against the honoring your parents commandment. I was running out of time, so I just looked at pictures and read the captions and picked St. Therese, the Little Flower. She looks nice enough and the roses make me think she likes to be outside. Mom took me to Penny’s to pick out brand new fabric for my Confirmation Dress. All that fabric was like being in Grandma’s flower garden in springtime. I picked a robin-egg blue fabric that looked plain blue from a distance, but had little whorls and lines that made up a secret pattern you can only see up close. The dress turned out perfect: a little scoop neck and slight gathers, but not at the waist, like a little girl’s, the bodice front and back went down to a point right in the middle, and the skirt flared just right, and best of all, no bow in the back. I felt like a grown-up. The day of Confirmation, Mom gave me her Immaculate Conception Medal to wear around my neck. She told me if I get scared, just hold onto the medal, and Mary, the Mother of God, would help me out. Jesus was her son, so he’d do almost anything for her, like turn water into wine. I was scared. The church was full. Everyone’s grandmas and grandpas came too. People were even standing in the choir loft, which never happened, except maybe at Easter when you have to go to church or you disobeyed a church law, which is another kind of sin on top the Commandment about honoring the sabbath. It’s super bad to get two sins for doing one thing. Pretty soon the questions would start. As each person got called on, I went over the answers to myself. I prayed I got an easy questions, but those got asked one-by-one. Finally, my turn. “What’s your name, young lady?” the Bishop said, his eyes piercing mine, so I stuttered out my name like I was unsure of even that. Shoot! I answered wrong already. The Bishop just stood there looking at me. I started to sit down, but my best friend, Connie poked me and pointed to the Bishop waiting for me to correct myself. “St. Therese, the Little Flower.” I said. I nod. I wasn’t sure if that counted as a lie; it probably did. At any rate, I was sure glad I picked St. Therese, even though I was ignorant of the details. Maybe that’s part of the mystery of how God tricks us into doing the right thing for ourselves sometimes. “What are the seven Gifts of the Holy Spirit?” the bishop asked me the easiest question of all, because the Gifts are what Confirmation was all about. Sister drilled that into all our heads. “Wisdom, understanding, counsel, fortitude, knowledge, piety, and awe of the Lord.” I answered looking back into his eyes, just the same way he looked at me. “Very good, Adela Maria Therese.” he said and moved on to Connie, who was clutching her mother’s Immaculate Conception medal. I stopped listening to the rest of the question and the other kids’ answers ’cause my turn was over, so I could relax a little. Then I remembered about the slap and I started worrying all over again. Father anointed my head, my heart and my hands. That went fine, just like I expected, plus that holy chrism smelled so good the little hairs on the inside of my nose stood up and begged for more. Next I walked over to the Bishop. My heart beat in my chest and up into my ears. The Bishop put one hand on my right shoulder, bracing me for the blow. He lifted his right hand and brought it to my left cheek. He placed his palm against my cheek and caressed the little bone in front of my ear with his forefinger. Then he smiled deep into my soul. I look right back into his soft, blue eyes and I smiled, too. Confirmation made me different; a difference on the inside. I understood the indelible mark on my soul that Sister told me about. I wondered if Mom would still pray to St. Jude for me. Probably, she got pretty busy with practical things, she might miss the difference in me. Still, I knew. That counted for something. ← What Was That You Said? Thank you for reading, Kristine. I hope to see you here again! Those intricacies sure stuck in my head. Your story was a catechism lesson in itself. It was a beautiful story too. I married into a Catholic family and had little background on the church prior to that. Thanks for sharing your personal story.